The Annecy Greeters network was launched in 2016 by Stéphane Favre. The idea of creating this project on the Greater Annecy appeared necessary to him following the discovery of some articles on the Greeters of France and a visit with the Geneva locals. After sharing his idea, “locals” joined him for this concept to be born. Since then, we have widened our circle of acquaintances and launched a mini Greeters recruitment campaign; then quickly the creation of a dedicated website was necessary, a project accomplished quickly with the help of the Greeters France model. Who are the Annecy Greeters? We currently have 8 Greeters with different profiles and ages. 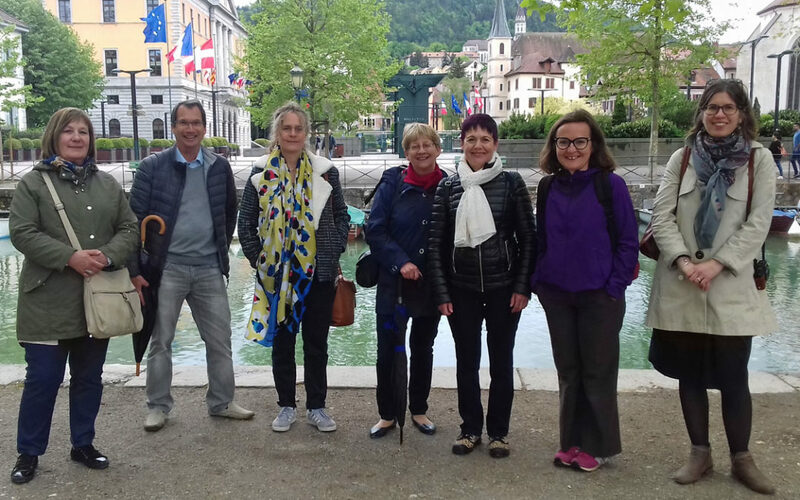 The Annecy Greeters are passionate volunteers who share their knowledge of their territory (city, district, memory sites) in the Haut-Savoyard department. The Greeters of Annecy offer walks on various themes. The most appreciated are of course those dedicated to Old Annecy (not to be confused with Annecy-le-vieux), the shores of the lake, the summer or winter night-time discovery with Christmas decorations, the approach to the industrial historical heritage. The Greeters of Annecy also offer to discover the streets and monuments, parks and gardens, good urban shopping and gastronomy tips, bars… sporting walks (sneakers recommended!) as well as family tours with quizzes adapted to children ! When we propose a visit, it is a bit like “live my life in Annecy” that is proposed. Each visit is unique and different. All the visits are shared as you could have had with family or friends, time is not counted. Come and join the Annecy Greeters for a visit with the locals! New retiree, I am from Annecy and I have been living in the Annecy area for several decades… I would like to share my favorites, for Annecy and its surroundings. I like local history, geography, economics and travel. Simple notions in English and Spanish, but a lot of smiles to share. Come and meet the Annecy Greeters. We welcome you with great pleasure.